Finally! Google has finally seen fit to introduce the “select all” function to Gmail. 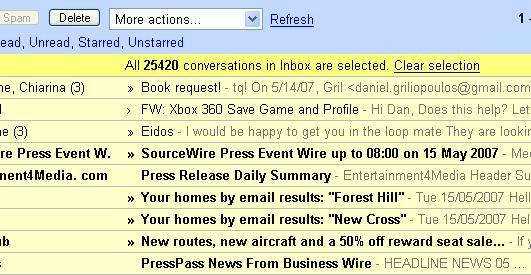 I have now marked all of the 25,420 unread messages in my inbox as read. Please don’t fill it up as quickly again, chaps. I’d like to point out that since my cameras both got nicked, I haven’t been able to take any photos so I’m resorting to uploading stuff from my mobile phone and thinking *really* hard about the photos I want to take. I’m going to start writing down spots and go back to them when my camera finally arrives. Next Post Next post: It’s not complicated, it’s over. I feel honoured and privileged that you actually reply to my emails ever, even belatedly…which is actually far more impressive.